Not to be confused with Dark Star. A black star with angry white eyes. Subtracts one star from the player's star count. 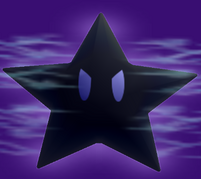 Ztars, also known as Shadow Stars in Mario Party 6, Dark Stars in the North American version of Mario Party 7, and Z-Stars in the PAL versions of Mario Party 7, are black counterparts to Stars found exclusively within the Mario Party series. They serve various functions from game to game, but usually take away one Star from the player's possession. Its name comes from a corruption of "Star," and is spelled with a 'z' instead of an 's.' 'Z' can be interpreted as a backwards 's,' referencing how Ztars are meant to be the opposite of Stars. Bowser giving a Ztar to Mario. The first appearance of Ztars was in the first installment of the Mario Party series, Mario Party, where they are the bogus item for Mario's Rainbow Castle. They appear as black stars with white eyes. Bowser will force the player to buy a Ztar for 40 Coins, but it does not have an effect on the player's star count. 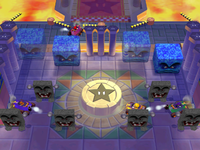 Ztars next appear in Mario Party 2 during the "Bowser's Multiplying Toads" event. If the player lands on a Bowser Space and triggers this event, Bowser will make two Toads appear on the board: one is real and other is really Koopa Kid in disguise. Each Toad will offer to sell the player a Star for 20 Coins. While the real Toad will sell the player a genuine Star, the fake Toad will actually sell the player a Ztar. Like in the first game, Ztars do not affect the player's star total, and serve only to waste their coins. Ztars make a cameo appearance in Mario Party 3 in the minigame Cosmic Coaster. The star on the goal looks like a Ztar until a team reaches it, at which point it changes to look like a Star and starts rocking from side to side. If a team is close to the goal but loses the minigame, it remains a Ztar and can be seen falling slightly askew. In Mario Party 4, Ztars make a few cameos in the Extra Room. A Ztar can be seen dancing under the boards in Mega Board Mayhem and Mini Board Mad-Dash from Thwomp's Backroom Ball. Also, after beating the game's Story Mode, a Ztar will appear in the Extra Room. Selecting it will start Beach Volley Folley, which the Ztar hosts. From this game forward in the series, the Ztar's eyes look angry. If a player lands on a Bowser Space in Mario Party 5 and has at least one star, Bowser will occasionally give the player a Ztar, which will subtract one star from the player's current total. In Card Party, players can uncover a Ztar Star Card that has the same effect but can make their star count go below zero. Ztar Star Cards are hidden within Star Cards, so it is based purely on chance whether the player receives a Ztar or a Star. Additionally, some Star Cards transform into Ztar Star Cards after being revealed and vice versa. In Super Duel Mode, a Ztar can be seen as the power source for the Ztar Engine engine part. The Ztar's appearance in Tricky Tires. Ztars were renamed to Shadow Stars in Mario Party 6. In Clockwork Castle, when Bowser encounters a player, he will give them a Shadow Star if they have one or more Stars. They serve the same purpose as in Mario Party 5. If the player has no Stars, Bowser will give them a Special Shadow Star, which takes away 20 Coins instead. Bowser will also give the player a Shadow Star if they land on Bowser's Battle Yacht in Castaway Bay. Shadow Stars also make minor cameos in the comparison quiz section of Speak Up and on the floor in Tricky Tires. In Mario Party 7, they are renamed to Dark Stars (or Z-Stars in PAL versions), but still have the same effect. At one of the Green Spaces in Grand Canal, the player must choose a chest from a group after the chests have been shuffled by a Blooper. One of the chests holds a Dark Star. If the player chooses this chest, they must take it. In Neon Heights during Bowser Time, Bowser sometimes puts a Dark Star in one of the chests. If the player pays Koopa Kid for this chest, they will be forced to take the Dark Star inside. A Ztar in Mario Party DS. In Mario Party DS, they are once again called Ztars, and occasionally appear in Hidden Blocks. If a player is unfortunate enough to get one, they will lose one Star. Also, a figure called Ztar appears at the same time the Star figure appears. A 3 Mini Ztars space. Although Ztars do not appear in Mario Party 9, Mini Ztars do make an appearance, where they deduct from the current amount of Mini Stars a player has. As with Mario Party 9, Ztars do not appear in Mario Party: Island Tour. However, Mini Ztars return. They are found exclusively on the Star-Crossed Skyway board and have the same function as before, deducting Mini Stars when collected. Ztars themselves do not appear, though Mini Ztars do, and function as they do in Mario Party 9 and Mario Party: Island Tour. Zutā Ztar, スター (Sutā) with a Dakuten (2 dots) beside the first letter, changing it from ス (Su) to ズ (Zu). O. Paca Ztar; "Estrella" (Star) with a "z" Replacing the "s". From the word "Opaca" (Opaque). Allets "Fosca" is a not-so-frequently-used name for woman. It is correlated to "dark", "foggy". "Allets" is "Stella" (Italian for Star) spelled in reverse. There is an unused music clip from Mario Party 8 which is a variation on the "You Got a Star!" jingle, suggesting that Ztars were originally going to appear in the game. This page was last edited on February 22, 2019, at 14:43.